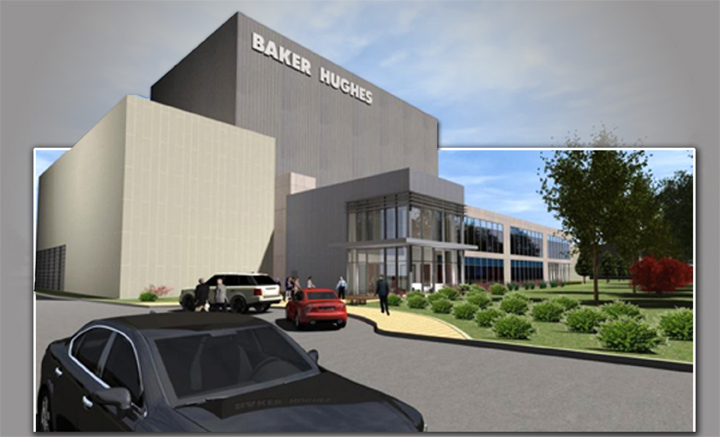 Baker Hughes Artificial Lift Technology Training Center - CGA Engineers developed the civil contract documents for the grading, paving, storm water collection, storm water control, and utilities. The new facility will have a gross footprint of 55,700 square feet and is located on a 6.5 acre lot adjacent to the existing facilities. The layout of the site accommodates parking for 86 passenger vehicles. The area around the building was designed to promote aesthetics in the front of the building where clients will be accommodated and functionality in the rear of the building where semi trucks and forklifts will manage equipment and material. The pavement around the building was designed so that semi trucks will be able to maneuve3r around the site and back up to the loading/unloading areas. AutoTURN was used for modeling traffic flows and maneuvers for loading and unloading zones. Most of the storm water from the new site will be collected and transferred to a storm water detention facility on the south end of the site. The storm water from the roof drains will be collected and transferred away from the building with an underground storm water network. The utility design for the project includes domestic water, fire line with hydrants, sanitary sewer, and natural gas. Plan views and profiles were developed for each utility line that will be constructed. Due to the nature of the facility, there will be several high voltage electrical duct banks that cross the site. CGA Engineers coordinated with the electrical engineers to establish the best location of the electrical duct banks and demonstrated their locations in the utility plans and profiles in order to reduce possible conflicts with utilities during construction. The site-grading plans are detailed and provide coordinate and elevation information for all points necessary for a surveyor to layout the construction staking. The contractor is not required to develop information from assumptions or layout the grading from contours. The layout information is explicit.